After years of tantalizing drone video, and then brief glimpses from special guests sharing photos on social media, the Apple Park Visitor Center finally opened to the public on Friday, Nov. 17. Anchored by a $427 million main building that is often referred to as the "spaceship" building, the overall cost to build the new campus was an estimated $5 billion. And while the new campus is an amazing feat of design and engineering, presided over by none other than Steve Jobs himself, visitors are also greeted with a special treat: an interactive augmented reality presentation. 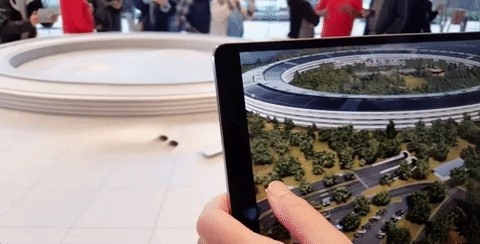 Visitors are able to use iPads placed around a featureless aluminum model of the campus to then bring up an AR version of the campus that reveals all of its secrets. From construction details to layout plans, the AR version of the campus even lets you lift the solar panel array on the main building's roof to peek inside. The time of day can also be changed to see what the campus looks like at night. One of the nearby residents in Cupertino uploaded video footage (below) of the AR display in action, and the virtual version of the campus is almost as beautiful as the real thing. Aside from giving the public an innovative new way to explore the headquarters of the top tech company on the planet, Apple's AR display is also a great use case demonstration for other companies looking for ways to deploy AR to engage the public. Apple held a special preview of the visitor center for local residents on Thursday, but now it's open to the public, so if you've ever dreamed of visiting the Apple mothership but didn't have a golden key to the temple of iPhones, your day has finally arrived. You can now swing by (the address is 10700 N. Tantau Ave, Cupertino, CA 95014) on weekdays from 7 a.m. to 7 p.m. or weekends from 9 a.m. to 7 p.m. (according to early reports) for a visit.